How would you like a chance to win $50,000 and help a good cause at the same time?! It’s EASY - buy a raffle ticket from Habitat Cabarrus and you will have a chance to win the $50,000 cash prize and help raise money to support the mission of Habitat Cabarrus at the same time!! Raffle tickets may be purchased online beginning March 27, 2019, through June 23, 2019. THE DRAWING FOR THE WINNING RAFFLE TICKET WILL TAKE PLACE AT CABARRUS BREWING COMPANY ON THURSDAY, JUNE 27, 2019. THE FUN BEGINS AT 5:30 PM WITH THE RAFFLE DRAWING TAKING PLACE AT 7:45 PM! YOU DO NOT HAVE TO BE PRESENT TO WIN. 1. 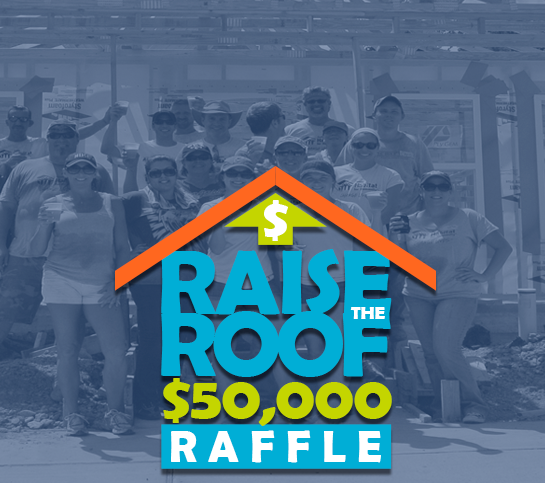 The Habitat for Humanity “Raise the Roof” Raffle is an annual event. The prize is $50,000 in cash, there are no additional prizes. Tickets may be purchased online at habitatcabarrus.org. Tickets are $100 each with an additional $4.00 per ticket added for processing fees (total of $104). All proceeds from this raffle will go to support Habitat Cabarrus. The raffle contest will begin on March 27, 2019, and tickets may be purchased through June 23, 2019, or until all tickets are sold. The drawing for the winner will be held on Thursday, June 27, 2019, at Cabarrus Brewing Company. This contest is void where prohibited by law. There is no limit on the number of tickets that may be sold. The contest is open to all persons age 18 and over who have a U.S.A. address. The Grand prize winner need not be present to win. Habitat for Humanity Cabarrus County is a registered nonprofit 501 (c) (3). Contest ticket donation is one hundred ($100.00) dollars plus a $4.00 processing fee. The ticket purchase price does not qualify as a charitable contribution. All entries must include payment by credit card (Visa, MasterCard, Discover Card & American Express Card). For all credit card purchases, the ticket purchaser must provide their full name, billing address, telephone number of the card holder, the credit card number and expiration date per the requested information on the entry form. Subject to availability, purchasers may buy as many tickets as they wish. Habitat Cabarrus reserves the right, in its sole and absolute discretion to disqualify: false entries, entries suspected of being false, illegible entries, defective entries, incomplete entries, altered entry forms, and entries that do not include valid or complete payment. Habitat Cabarrus is not responsible for printing errors in any contest-related material or for lost, late, misdirected or non-delivered or corrupt internet messages, or any other failure to receive orders or deliver receipts prior to the drawing deadline. Habitat Cabarrus reserves the right to withdraw this offer at any time. If for some reason the contest is cancelled prior to the drawing, all ticket purchases will be refunded. The raffle Prize is $50,000 cash. The winner is subject to relevant federal, state and local taxes and other expenses. The IRS requires nonprofit organizations to withhold 25% federal income tax from the prize and to report it on IRS Form W2-G and Form 945. These forms must be filed by January 31 of the year following the payment of the prize. Any other fees or taxes, in connection with the cash prize, are the sole responsibility of the prize winner. The ticket purchaser whose raffle ticket is drawn at the Prize Drawing will be deemed the winner of the prize. The winner will be notified by email, telephone and/or U.S. Mail using the information provided on the Entry Form. If the winner cannot be located or fails to respond to attempts to contact them within thirty (30) days after Habitat Cabarrus’ first attempt to contact them, the winner will be deemed to have forfeited their prize. Another winner will be drawn. The prize may be forfeited if the second winner cannot be reached or cannot accept or receive the prize for any reason. The winner grants permission for the use of their name, photograph/likeness for advertising and promotion for this and similar promotions without compensation, unless prohibited by law. The contest is subject to these Official Rules. These Official Rules shall not be changed by any oral statement made by any person acting on behalf of Habitat Cabarrus. By participating, raffle ticket purchasers agree to the following: 1. To be bound by these complete contest rules and the decisions of Habitat Cabarrus shall be final and binding. 2. To waive any right to claim ambiguity in the contest or these Official Rules, except where prohibited by law. 3. By accepting the prize, the winner agrees to release Habitat Cabarrus, its officers and members, representatives and agents, and any person or entity associated with the production, judging, or administration of the contest from and against any claims, damages, disability, attorneys' fees, and costs of litigation and settlement, as well as any liability due to any injuries, damages or losses to any person (including death) or property of any kind resulting in whole or in part, directly or indirectly, from redemption, acceptance, possession, ownership, misuse or use of any prize or participation in any contest-related activity or participation in this contest. 4. Except where prohibited by law, the winner’s purchase of a ticket and acceptance of a prize constitutes permission for Habitat Cabarrus to use the winner’s name, photograph, likeness, statements, biographical information, voice, and city and state address for promotional or advertising purposes in connection with this contest on a worldwide basis, and in all forms of media, now or hereafter known, in perpetuity, without review, permission or further compensation. 5. Habitat Cabarrus Board of Directors and Staff and their immediate family members are ineligible. Perry Productions staff and their immediate families are also ineligible. Taxes are the sole responsibility of the winner. The winner will receive an IRS Form W2G and the amount of the winnings will be reported to the IRS of the awarded prize. The winner is subject to relevant federal, state and local taxes and other expenses. The IRS requires nonprofit organizations to withhold 25% federal income tax from the prize and to report it on IRS Form W2-G and Form 945. These forms must be filed by January 31 of the year following the payment of the prize. Any other fees or taxes, in connection with the cash prize, are the sole responsibility of the prize winner. The ticket purchaser is advised to consult his or her own tax advisor(s) with respect to the tax liabilities that may arise from winning a prize in this contest. The ticket purchase price does not qualify as a charitable contribution. Habitat Cabarrus reserves the right to disqualify any entrant it finds to be tampering with the entry process or the operation of the contest or violating these Official Rules and reserves the right to cancel the contest should it suspect fraud or for reasons out of the control of Habitat Cabarrus. Disputes regarding these Official Rules and/or this contest will be governed by the internal laws of the State of North Carolina. Any claim(s) or controversy between any of the contest participants and Habitat Cabarrus arising out of or relating to the contest and or the contest rules and regulations will be settled by binding arbitration administered in Cabarrus County, NC by the American Arbitration Association under its Commercial Arbitration Rules. Any judgment on the award rendered by the arbitrator may be entered in any court having jurisdiction thereof. Caution should be taken for any attempt to deliberately damage or to undermine the legitimate operation of the contest. Any such attempts may be in violation of criminal and civil laws and will result in disqualification from participation in the contest. Should any attempt be made, Habitat Cabarrus reserves the right to seek remedies and damages, including all fees, such as attorney fees and court costs, to the fullest extent of the law, including criminal prosecution. A contest winner’s sole and exclusive remedy for any claim against Habitat Cabarrus arising out of the sale of tickets or the conduct of the contest will be limited to the return of the purchase price paid for the ticket(s). In no event will Habitat Cabarrus, its directors, officers, agents or representatives be liable to any party for any loss or injury to earnings, profits or goodwill, or for any incidental, special, punitive or consequential damages of any person or entity whether arising in contract, tort or otherwise, even if advised of the possibility of such damages. Raffle tickets are $100 each with an additional charge of $4.00 for the processing fee (total ticket cost = $104). Habitat for Humanity Cabarrus County has partnered with Give Lively to securely process your online donation. This transaction will appear on your credit card statement as "Habitat for Humanity Cabarrus County". This transaction is subject to Give Lively's Terms and Privacy.